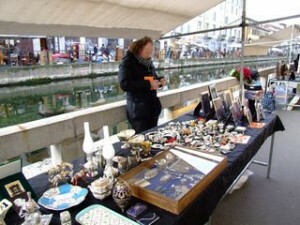 Milan Antiques Market, canalside on first Sundays. If your stopover in Milan includes the last Sunday of the month, amble down to the canals of the Navigli district for the Mercatone dell’Antiquariato del Naviglio Grande––one of the largest outdoor antiques markets in Italy. Along both sides of the canal, more than 400 vendors set up booths to sell artifacts and bric-a-brac, furniture, books, toys, jewelry, clothes and more collectibles. 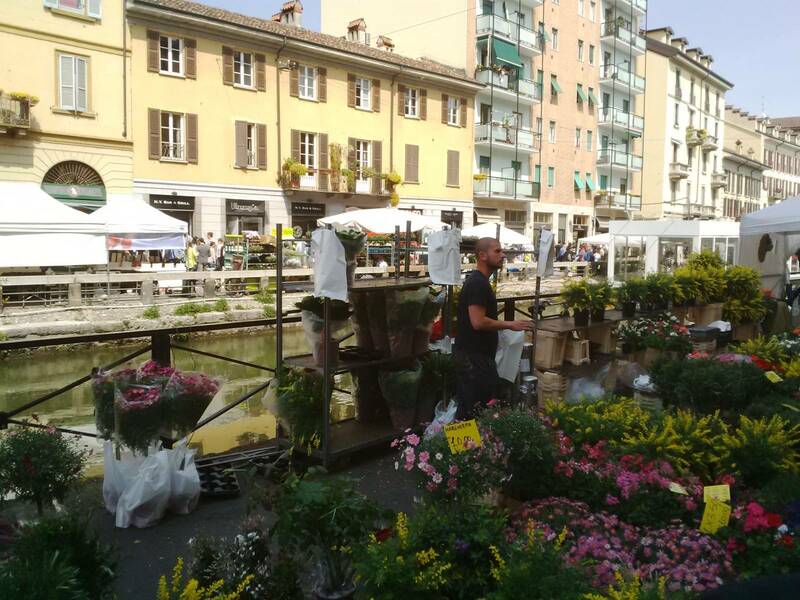 On market day, the line-up of permanent shops, cafes and art studios on the canal are also open for browsing and for taking gelato, lunch and refreshment breaks. 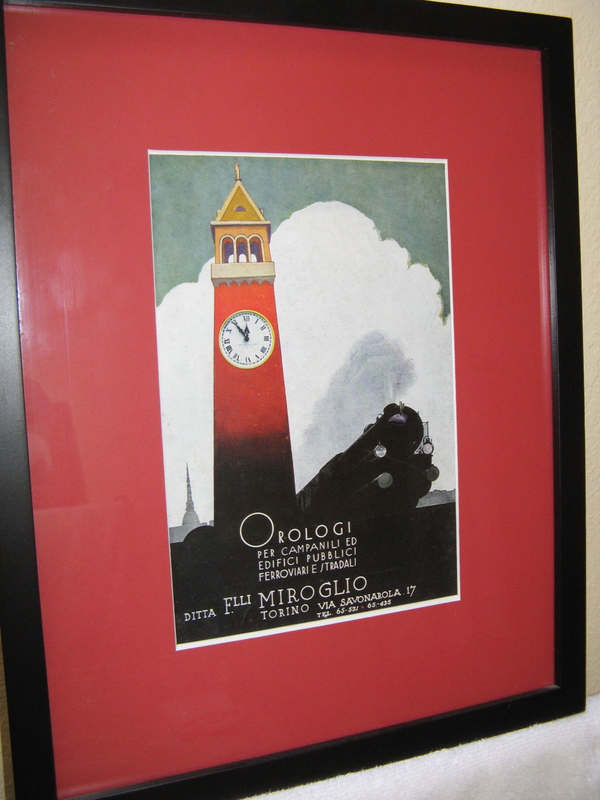 A Vintage Print from the Milan Antiques Market. 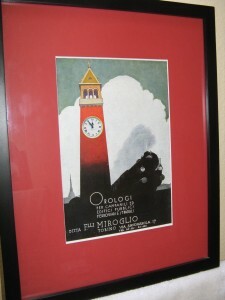 which I gave for gifts and framed when I got home (see the fabulous Art Deco print here). Murano glass chandeliers, old kitchen and wood-working tools, jade, putti, old silver–you could wander all day. 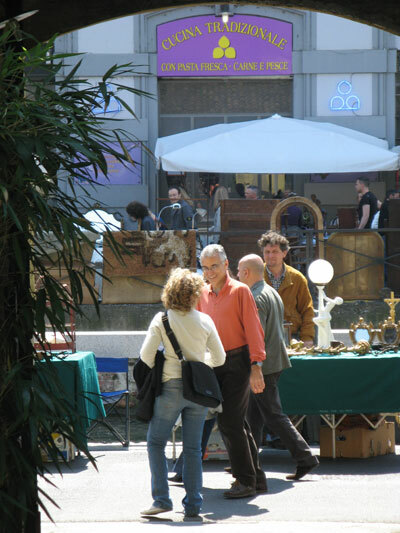 Tip: the antiques market in Milano opens at 9 but isn’t fully open until about 10:30 a.m. My advice is to cruise through in the cool morning and return to your favorite vendors to bargain in the afternoon when they are open to reducing inventory. I had good luck with this strategy, although when I went back to bargain for a gorgeous amethyst bracelet––it was long gone! At night the canalside glows with the lights of the bars and restaurants that liven up one of the most appealing districts of the city. Departing from the Darsena at Porta Ticinese from April through September, tour boats meander the Navigli canals, both daytime and in the evenings. You can purchase tickets at the tourist office, which is the Urban Center in the Galleria Vittorio Emanuele II in the city center, or book your boat tour online. In spring, with a “Milanocard,” you can take a guided tour of nearby Villas of the Naviglio, along the leafy Large Canal (il Naviglio Grande), including the Cistercian Abbey of Morimondo, lunch overlooking the Abbey, and the 18th century neoclassical Villa Annoni. The card also gives you free transport and discounted admission to museums, restaurants, events, accommodations and other tours. Lonely Planet has one of the best sites for info and resources related to Milan––and other cities in Europe. Get out and about on these active tours in Italy!